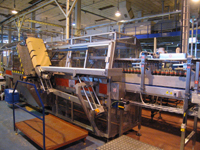 Baumer wraparound cartonners are manufactured for 20 – 80 cartons per minute! The wraparound cartonners supplied by Enterprise Tondelli are manufactured by Baumer Srl of Modena, Italy. Baumer specialise in only wraparound cartonners, shrinkwrapper or super combined machines to handle both carton, trays and shrink film. The wraparound cartonners have been used for a wide variety of products and package including: soft drinks, wine, water, baby food cartons, beer, wine in bricks, rice in pouches, yoghurt in pots, edible oils, mineral oils, pharmaceuticals etc. The flow of the bottles on Baumer wraparound cartonner is always with the carton blank entering into the bottle flow. This avoids label damage typically found when the bottles are moved into the carton. Additionally this system ensures a greater line efficiency. Benefits of the machine include servomotor machine control with a Siemens or Allan Bradley Plc and an open program architecture so no “black box technology. If dividers are to be used the partition insertion magazines are at low level on the machine reducing operator levels and reducing staffing costs. Monobloced laning for rice pouches or baby food boxes. The latest super combined machine from Baumer can handle wraparound cartons, shrinkwrapped trays and also film only packs with automatic change over and no requirement to move heavy conveyors. With a vast experience we are able to supply cartonners for most applications.